Needs a discussion on this, thursday heat in SA and Adelaide especially given it's a capital city....models been fairly consistent about 45C+ in the city for almost a week but the timing of the change has varied....now it's looks almost certain that we will see the change well after dark and increasing heat potential right through the day so a late max...BoM going for 44C atm, which looks unders, now talk of 45C which is closer to the mark but I think the all time record of 46.1C is in danger, just unsure how west terrace handles extreme heat, lots of gardens there and parklands. Old Kent Town site I've got no doubt will go 46C+ and northern suburbs 46-47C maybe even a stray 48C somewhere on the northern plains between Adelaide and Port Wakefield, very low lying, almost minimal seabreeze and should be away from any convection that will form in the arvo over ranges and beyond. ACCESS-R 850 temps for 730pm...best potential between 430-730pm charts 29-30C 850's seems pretty good. ACCESS-G goes more for 30C. EC and GFS 28-29C. So good chance for some multiple site records on thursday. Today's efforts only highlighting how hot thursday could be as the true heat is still to come down. No, any record to be counted for Adelaide MUST occur at West Terrace as it is the official weather station for Adelaide. It's an intriguingly complex situation (says he, who might well be one of those who has the pleasure of explaining the complexities of Adelaide observations to the world should anything interesting happen on Thursday). My sense from the data so far is that the new West Terrace is a bit cooler on hot days than the old West Terrace - which wasn't quite as far into the parklands - but we don't yet have enough data to quantify that. Another number you'll probably see if it gets over 46.1 on Thursday - at least in social media and the letters column of the Australian - is the 47.6 measured using a Glaisher stand on the same day in 1939 that 46.1 was measured in a Stevenson screen. 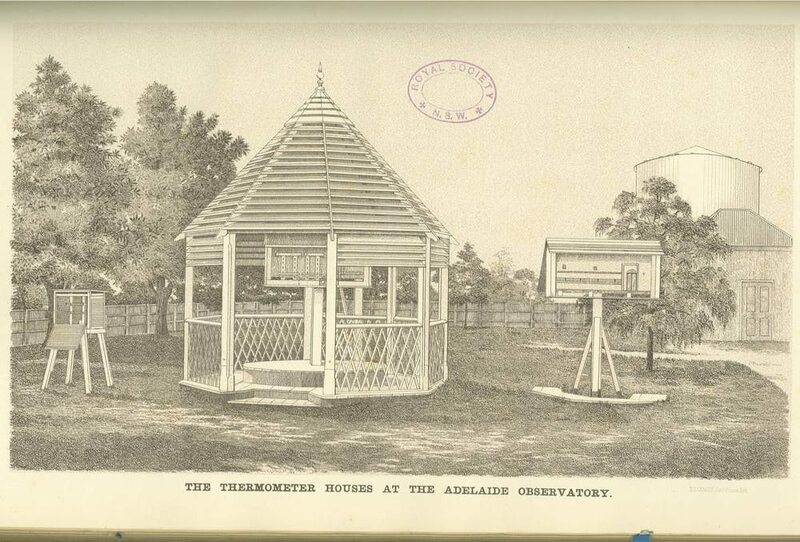 Adelaide did parallel observations with the two instrument types for 60 years; we've long had the monthly data but have only just got holds of the dailys and are currently analysing them. Obviously the Stevenson screen one is the relevant one for comparisons with the present day. thanks for clearing that up Blair... its been a point of query for a few of us over last few days. be doin' cartwheels over this one. cockles of my black heart. i might take the day off and go corepunch me a hotpool. Weatherzone is calling 48c for Parafield. Ceduna getting close to its ATH of 47.9..
Forecast for 49 in Port Augusta tomorrow, can't say I've ever seen that! Yeah still there just not a gusty that I'd hope, but what do I hear? I can see us reaching 49ºC here (Booborowie). We usually go by Port Pirie's forecast (though the BoM and Wz insist our temperatures should be the same as Clare ). These past two weeks we've been consistently 2-3 degrees even hotter than Pirie, much to my chagrin. Incredible setup for tomorrow, been a week in the making but models have been pretty good with it in the last few days with solid 28-30C 850hPa temps over a vast area with pockets of 31C NW of Port Augusta and parts of the Eyre Peninsula. The Red Rocks, Eyre and Eucla temps are basically a taste of the potential of the airmass....those areas are nice and low lying. The Ceduna 48.4C outside the core of the hottest air is a mighty impressive effort. They will rise very quickly tomorrow but will be especially watching the Port Augusta, Tarcoola, Kyancutta (unless trough ruins it), Wudinna, Whyalla areas tomorrow and Roseworthy on outer N plains of Adelaide will probably go 48C rounded. I'd like to see a station around Dublin to Mallala which will probably be even hotter again. 48-49C seems the most likely ballpark for the highest temps but I feel 50C might just be a tickle too far but one never knows with quick little spikes sometimes....most like PA or Tarcoola as Blair attributed to. Elsewhere, should see numerous site records across SA, especially further south, probably some more obscure spots will get all time max temps that we don't normally think of as being hot spots. West Terrace I'm still unsure on how it will go given the parklands around it, but I think it will beat 45C...closer to 46C but 50/50 on the all time record. I think Kent Town given it's more urban siting will possibly break 47C. Parafield, Edinburgh all 46-47C. It's going to be a day to remember. Port Pirie just cracked the 40C before 9am!